DYMYTRY is one of the most successful metal bands from the Czech Republic. The band was founded in Prague in 2003. Since this time DYMYTRY released 4 studio albums, 3 EPs and a Live DVD/CD. The band members are influenced by Metallica, Korn, Machine Head, Soilwork, as well as modern rock acts like Five Finger Death Punch, Bring Me The Horizon and Parkway Drive. With their unique sound, which DYMYTRY calls Psy-Core, the band built up a strong fan base in their home country. In 2010 the bands line up was complete and the success began. DYMYTRY won the WACKEN Metal Battle which gave them the opportunity to play on the Wacken Open Air. One year later DYMYTRY performed at MASTERS OF ROCK in Zlin. This time was definitely the breakthrough for the band in their home territory. The headliner shows and festival stages got bigger and bigger. In 2015 DYMYTRY started their first big headliner tour with 32 shows in very well known venues all over the Czech Republic and most of the shows were sold out. A DYMYTRY show is more than only a rock concert, it is an adventure! Big light show, pyros, LED walls and a costumed band on stage! In a Spring 2018 the band did their “15 Years Behind The Mask Anniversary Tour” in the big arena of Czech Republic with Hämatom from Germany as a special guest. After that a big friendship began. Since the beginning of October 2018 DYMYTRY is on tour with HÄMATOM in Germany. 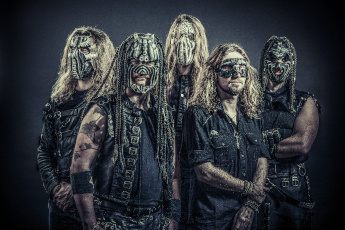 Before the tour DYMYTRY and HÄMATOM recorded the single “Behind the Mask” and a video for the song, which both bands released on the 29th of September. On the 5th of October DYMYTRY released the 4 track EP “Beast from the East” worldwide. This is the first EP in English language. The EP is a tastemaker for the upcoming new album and was recorded with the producer Kristian “Kohle” Kohlmannslehner (u.a. Powerwolf, Aborted, Eskimo Callboy, et al.) at the Kohlekeller Studios.